The California Winter League has confirmed its dates for its 10th season. Traditionally the CWL has seen players report in mid-January and depart Palm Springs a month later in mid-February. 2019 will see players reporting to Palm Springs Stadium on February 4th and departing Palm Springs on March 4th. Several factors led up to the confirmation of the 2019 CWL dates, including internal and external factors. From a baseball standpoint, the number of scouts and managers who are able to attend the California Winter League as members of the coaching staff and guests will remain unaffected. Players can expect to compete in live games in front of MLB scouts and professional independent league managers during the CWL’s month-long season. External factors affecting the confirmation of the 2019 CWL dates included an increase in demand in both players wishing to participate in the CWL as well as visitors to the Palm Springs area in January and February. With the CWL becoming the Exclusive Winter League of the Frontier League from 2018 forward as well as the expectation that the Arizona Winter League will not operate from 2019 forward, more players than expected are looking to begin or advance their professional careers at the California Winter League. Therefore, the demand for hotel rooms around Palm Springs exceeded inventory. Rather than provide a lesser experience and ask CWL players to stay in smaller motel rooms instead of the timeshare resort facilities at the Marquis Villas, the decision was made to keep the CWL experience unique and first-class and confirm a reporting day of February 4th and a departure day of March 4th. This way, players who register before Thanksgiving are guaranteed their spot at the Marquis Villas and late registrations are guaranteed a comfortable hotel complete with breakfast provided so they can focus on performing on the field each day. California Winter League games will begin on February 7th, 3 days after players report. The CWL Championship Game will take place on March 3rd. The general format of the league, aimed at showcasing players for pro scouts and managers looking to sign them, will remain unchanged. 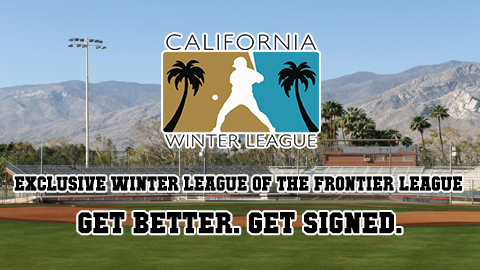 For more information and to register for the 2019 California Winter League, visit www.CaliforniaWinterLeague.com.